Visitors to the Pompidou Center should most definitely take a two-block detour to check out one of the most interesting patisseries in the Marais–Pain de Sucre (which translates to “Sugar Loaf”) on the Rue Rambuteau. The award-winning shop was founded in 2004 by pastry chefs Didier Mathray and Nathalie Robert, both of whom honed their craft at Paris’s Michelin three-star restaurant Pierre Gagnaire. And the boutique was expanded in 2012 to a add next-door space that focuses solely on breads and savory creations, including to-go sandwiches (try the to-die-for roasted duck and fennel sammy). Unusual flavor pairings are the hallmark of Pain de Sucre and appear in many of the shop’s avant-garde tartes and cakes, including combining green apple with coriander, caramel with rosemary, raspberry with saffron, chicory with whiskey, and endive with orange marmalade. 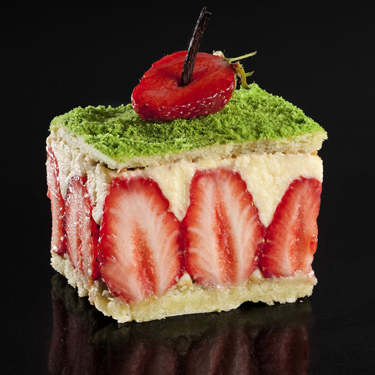 Perhaps the ultimate combination of flavors is seen in Mathray’s and Robert’s unique Foie Gras Cake that marries savory goose liver with typical sweet cake ingredients. And while that blend may sound off putting (or even flat-out unpleasant), the result is actually anything but. 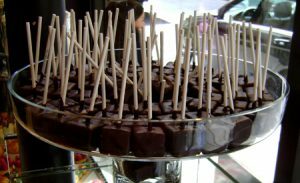 In fact, the cake has become one of the shop’s all-time best sellers. For more tried-and-true options, have a go at the macarons (available in both standard and off-beat flavors) millefeuille, Zanzibar cake (a cinnamon-laced pain d’espice), raspberry tarte, the Momo (hazelnut cookie topped with chocolate mousse and mango or passion fruit cream), the orange-flower flan, the Baobab (a baba au rhum in which a small “syringe” filled with rum is stuck into the top of the cake, allowing you to “inject” the booze into the treat when you’re ready to eat it to avoid over sogginess) or the lemon-lime tarte. All are delicious. 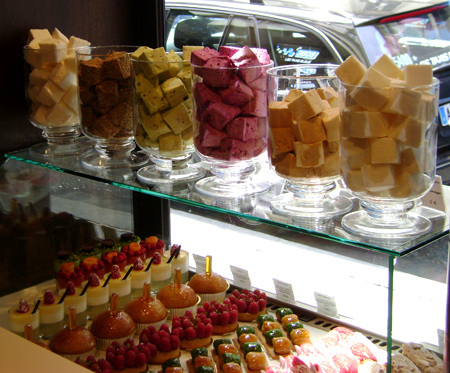 Believe it or not, though, marshmallows (guimauves) are the patisserie’s specialty, and are prominently–and artfully–displayed in the boutique’s window. And these aren’t the stale mini-cylinders Americans buy pre-bagged in U.S. grocery stores These fluffy treats are practically cloud-like, coming in such flavors as chocolate, whiskey, green tea, rosewater, hot pepper and an absolutely to-die-for salted caramel. Kids–and more than a few adults–go crazy for the dark chocolate-covered marshmallows served on a stick. 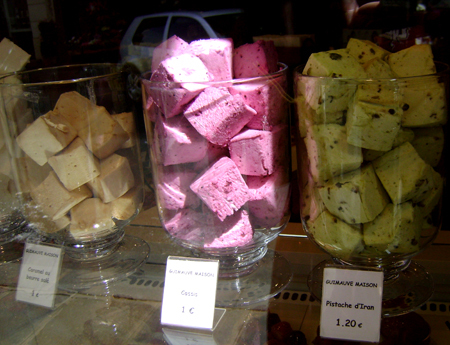 Another hugely popular guimauve is the coconut-covered chocolate marshmallow, available in plain or toasted coconut varieties. This entry was posted in Marais, Patisseries, Right Bank and tagged Didier Mathray, Nathalie Robert, Pain de Sucre by Bob Adams. Bookmark the permalink.